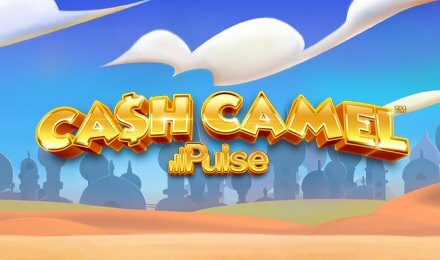 An exciting virtual trip to the Arabian peninsula awaits you on the 5 sensational reels of Cash Camel Slot! Designed by iSoftBet, this Arabian-themed game comes filled with fun characters who will take you to where the untold riches are hidden. The reels spin within a timber frame which supports a purple roof. On either side of the reels, you will find a camel with cash all over it and a Sultan looking cactus. Ready to have a whale of a time? Grab any of your favourite devices and log onto your Vegas Spins account to set going! Once you load up Cash Camel Slot, you will be required to select the bet value on the Total Bet field. The multiplicity of symbols that you will find whirling on the reels includes a lizard, a golden snake, a pink scorpion, a wild dog and the usual 10, J, Q, K and A. Bet Levels: Cash Camel Slot doesn’t offer any Bet Levels. Amount of Paylines Selection: There are 20 paylines available in the game. These remain enabled from the start of your gameplay till the end. Coin Values: The betting options range from a minimum of 0.20 up to a maximum of 20.00 per spin. The Wild Card on Cash Camel Slot is represented by the cactus with the turban. It substitutes for all other symbols when appearing on the reels to complete winning combinations. However, it will not replace the cactus scatter icon. This absorbing bonus round is activated by lining up 3 or more of the camel scatter symbols anywhere on the reels. Here, you receive 10, 20 or 30 free spins for landing 3, 4 or 5 camels. If you manage to land 1, 2, 3, 4 or 5 camels within this round itself, you can be awarded an extra 1, 2, 10, 20 or 30 free spins respectively. In addition, whenever the wild cactus appears on reel 3, it will enhance the multiplier by 1x up to a maximum of 10x. Each time the wild cactus appears on reel 3, you will be prompted to select one of the barrels displayed which will grant 5, 7, 8 or 10 free spins. In this bonus round, reel 3 is completely wild and any wins will grant an additional free spin with those winning symbols locked in place. Ready to have some gamesome leaps and frolics?